Giverny the "American colony of Giverny"
In the 19th century and turn of the 20th century, numerous American artists and students flocked to Paris to copy and study the old masters. Carolus-Duran attracted such American artists as Will Hicock Low, J. Carroll Beckwith, John Singer Sargent, Theodore Robinson and Theodore Earl Butler. The friendship between Carolus-Duran and Claude Monet led them all to Giverny, the little Norman village situated in the Seine valley not far from Paris. It is there where Claude Monet moved in 1883. The exceptional light falling on the Giverny countryside inspired Monet. Monet was pleased to talk about his artwork and gave advice to John Leslie Breck, Blanche Hoschede Monet, Butler and Lilla Cabot Perry. 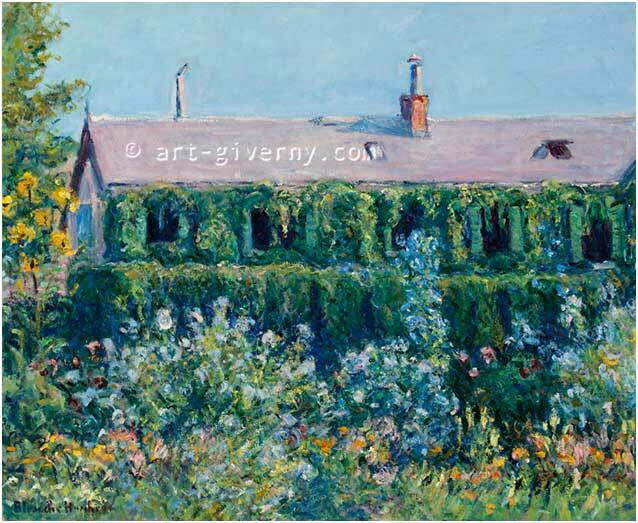 Even though Monet certainly did not encourage them to follow him, these Americans fell into the habit of staying in Giverny at the Hotel Baudy. The Americans painted the village and its surroundings, discovering the Impressionist style and the art of painting en plein air (in the open air). They formed an American artist colony. They bought houses in Giverny and the village became a popular destination for American artists. Most of them brought this new style back to the States with them. However, due to the increasing number of new artists, Monet thought of leaving Giverny; after all, he came to Giverny to find peace and inspiration.